Georgina Ferguson was on the Tube at Kings Cross when that bomb went off, killing 26 people. She rarely talks about what happened — many of her friends don't even know she was involved. But she's wanted to thank a stranger who helped her on that day ever since. A decade later, she's created an animation to reach out to the person she's never had chance to thank. "I am no wordsmith so I thought it might be best to use animation to communicate my story," she says. "This is my story of 7/7, and how a stranger’s kindness helped me get out and start to move on. I never asked my guardian angel’s name, something I regret as I’ve never been able to really thank them. This animation is my way of giving them thanks — I really hope it can reach them. "For me, this film is about more than just personal catharsis and sharing an experience. It's about an act of remembrance, tribute and gratitude..."
Georgina told Londonist her thoughts are with all the families affected today. "That morning, everyone came together as a community. All Londoners were affected in some way. I hope Londoners can connect with the video today." "I have a sense of pride in myself, my team and Londoners"
A retired member of the British Transport Police told Londonist his work post-7/7 was what he'd been most proud of in his 30-year career. "On the day itself, I was frustrated at not to be doing something to help immediately. But the one thing you don't do as a member of the police is just deploy oneself. Later that day, I was tasked with leading a dedicated team at the mortuary. From a detective's point of view, the bodies of the deceased, both the terrorists and the passengers, as well as the train carriages, the bus, and the CCTV are all evidence. Everything is part of the crime scene, all part of a huge investigation underpinning a national tragedy. "We were very conscious that we had to work expeditiously, that our work needed doing as quickly as possible, but that would still feel painfully slow for the families of the deceased. We needed to work with integrity, out of respect for the deceased. But it was a very frustrating process. We worked 16-hour days for three weeks, but it still took such a long time to confirm positive identification on the victims. "Looking back, I'm very proud of the way so many different parts of London came together that day and in the weeks that followed. As the emergency services, we're used to doing our jobs, but I think that Londoners really did step up to the plate: the public, taxi drivers, everybody worked really hard. Londoners were quietly supportive of each other — very contained, very British. It was a watershed moment for the UK mainland. "When I reflect on that time, it is with a sense of pride in myself, my team and my fellow Londoners." "I wanted to get out into the fresh air as quickly as possible"
"I was taking my usual northbound Northern Line train from London Bridge just after 9am. Just after we left London Bridge, the driver announced we would not be stopping until King's Cross. We stopped for long periods, and I remember the driver explaining we would move forward very slowly, and stop suddenly, but not to be alarmed. "When we did creep forward again, we stopped in the tunnel. Then there was an announcement that we would be evacuated through the drivers cab, the only part of the train beside the platform. "The first thing I noticed was a rubbery, burning smell. Everyone seemed quite nervous. We left the platform as quickly as we could. I saw a woman weeping and crying out, with a man trying to comfort her. There were people with blackened faces, filthy with what looked like soot. I started up the long escalator, which was stationary. There were distressed and injured people with us. When I looked down there were streaks of fresh, wet blood on the metal treads of the escalator. When we got to the top, there were people lying on the floor in the ticket area, being tended to by staff, other passengers and paramedics. I wanted to get out into the fresh air and daylight as quickly as possible, and it was such a relief to come out onto the pavement. Police had cordoned the area with tape, and a helicopter hovered overhead. I asked a fireman what had happened, and he said he didn't know. I don't think that was a stock answer; he seemed shaken and genuinely did not understand what was happening. I asked a man covered in soot what had happened to his train, and again he said he didn't know, a derailment or something, maybe a crash. By this time, people were ducking under the police tape if, like me, they hadn't been involved in the 'accident' itself, and that's what I did. "I walked towards Islington, and eventually caught a bus to work. I managed to get connections on my mobile, and called work and my parents. That's when I learnt about the bombs." "I thought I'd never understand Londoners' reactions"
"I was going to move to London one year later. 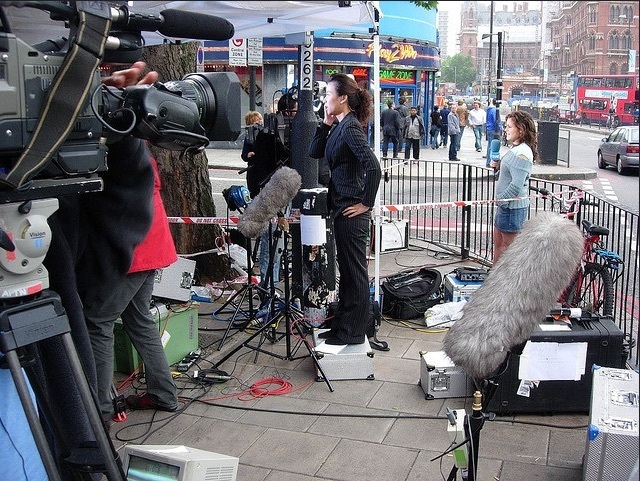 I remember following on TV the images of Londoners carrying on with their lives and acting as normal as possible. They shocked me! I had seen all of Spain stop and demonstrate, march and mourn en masse in 2004. I thought I'd never understand Londoners. Now I've been here for nine years and I would not expect anything but the old (and sadly, overused) 'keep calm and carry on'. London won't miss a beat. London shall never stop." "I was going to Moscow the day after and needed to collect my passport from the visa agent. I remember the eerie feeling of walking from Shepherd's Bush to Clerkenwell — the Underground of course was not running — as thousands of people were all walking towards me, on their way home, in absolute silence. I'll never forget that. RIP the victims from that day — we'll never forget you." "I thought everything was changing"
"I thought everything was changing. On the train home all I wanted to hear was the theme tune to The Archers on Radio 4. Just to bring Britain back in my mind. "I've never listened to The Archers in my life." 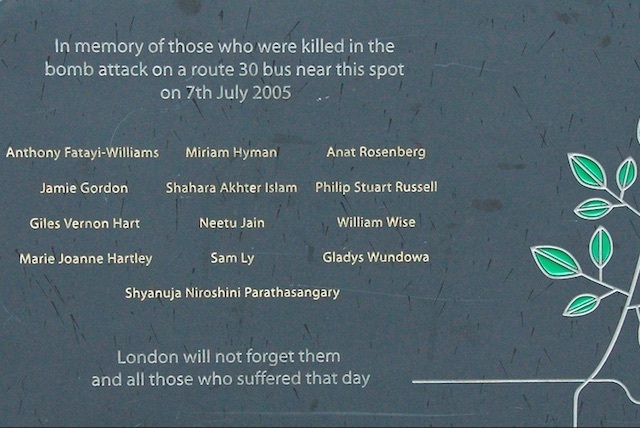 "Each time we've come out stronger"
Londonist Senior Editor Rachel Holdsworth also remembers the immediate aftermath of the bombings. "What I think affected me most was the solidarity that came out of the attack. For the two minute silence on 14 July, we didn't just pause at our desks. Everyone in my office — and, judging by the pavements, most other offices — came out onto the street. Taxis and buses pulled to the side of the road. But we didn't have our heads down. It felt like a show of defiance as well as remembrance. London has gone through plague, fire and war, and each time we've come out stronger. Reading Ken Livingstone's speech again this week made me tear up a bit; he talked about the freedom that a city like London offers and how that freedom will never be beaten by a few fanatics. 'Whatever you do, however many you kill, you will fail.' Given the state of the world right now, politically and economically, I think that message is one we can still hold onto. Eight million Londoners: one London."